When insurance broker Albert Heraud bought a sailboat in 1989, ITER was only one year into Conceptual Design Activities (CDA) and the project's acronym was unknown to the general public. Few people were aware that "iter"—not the acronym but the noun—translated as "the way," "the route" or "the journey." One would have to have been a Latinist or theologian to know this. Albert Heraud, however, was neither one nor the other. 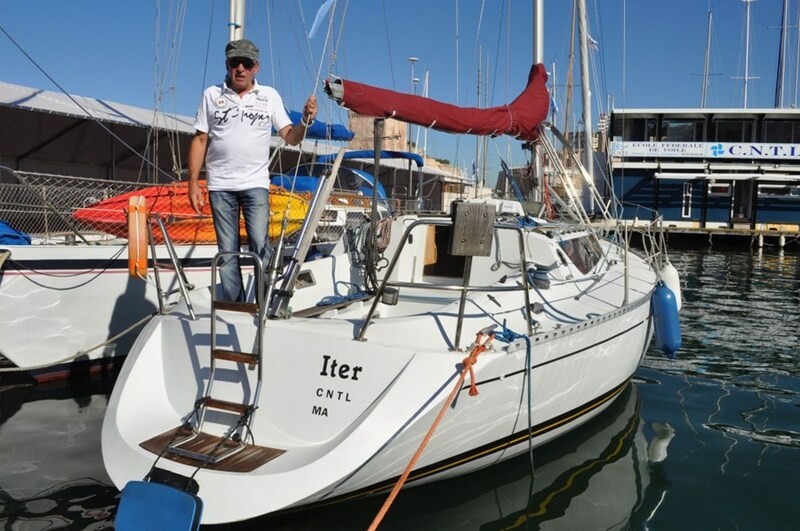 But as his daughter had just started studying Latin in lycée, she suggested that "Iter" would be quite an appropriate name for the family's sailboat. "It was a perfect choice, and an original one," says the proud father today. "You cannot imagine how difficult it is to find a meaningful name for a boat ..."
And so it was that, for some 15 years, Iter sailed the seas, hopping from island to island in the Bay of Marseille, taking the Herauds to Corsica in the summer, unaware of the bigger ITER that was taking form and gathering momentum on the horizon. "At some point, it must have been around 2004," Heraud recollects, "ITER began making headlines, especially here in the local press because of the possibility that Cadarache would host the project." The realization that there was something else also named Iter—and something that promised to be very big—was embarrassing; wasn't it a bit pretentious for a nine-metre sailboat to bear the same name as a multi-billion-euro project?" It got to the point where Iter's skipper considered changing the name of his boat. "However, I decided not to. After all, I was here first, at least before everybody around me became aware of ... that other ITER." Still, relations between Iter-the-sailboat and the ITER Project are not simple. When ITER Communications reached Heraud to enquire about his boat, he refused to believe someone from the project was actually calling him. It took several phone calls, a lot of persuasion and the production of some evidence before he agreed to meet, on a bright Saturday morning, on Marseille's Vieux-Port where Iter is docked. And until this article is published, he will not be completely certain this whole thing is not a hoax. Special thanks to Stéphane Vartanian, of CEA/IRFM, for having spotted Iter in the Vieux-Port Marina.